Meet the new President of Onondaga Community College and discuss working with the non-profit community. They will provide a follow presentation of the latest funding progress for our Association’s Business Plan. Is Your Nonprofit Raising Money through SEFA? Update Your Profile Online Today. As you know, SEFA is the State Employees Federated Appeal. SEFA is a charitable solicitation of New York state employees conducted under the authority of State Finance Law § 201-1. State employees may give to any of the charitable organizations that participate in SEFA and may at any time revoke or modify a contribution made through payroll deduction by providing a written request to the employee's payroll office. Many of you already participate and raise funds through this campaign. IMPORTANT: If your organization has recertified with SEFA this year you should review the online directory of charities as well to make sure your listing is there and correct. Important: If it is not, please email Suzanne Maloney, SEFA Director(suzanne@sefanys.org). You may also choose to email Joanne Macklin at Community Works as they are attempting to track the extent to which any nonprofit is having trouble getting their information updated. Syracuse, N.Y. — New York State Comptroller Thomas DiNapoli will release a new report on property tax exemptions Wednesday morning in Syracuse. DiNapoli said he will appear with Mayor Stephanie Miner at 10:30 a.m. at City Hall. About 51 percent of the property in Syracuse is tax exempt. Miner has tried to negotiate with the big non-profit hospitals and schools to make some payments instead of taxes to help the city pay for the cost of public safety, roads and other services. Syracuse University agreed to pay $500,000 a year for five years and Crouse Hospital agreed to pay $50,000 a year for four years. Others have resisted. Syracuse.com readers identified property tax exemptions as a concern in a recent survey of ways the city could raise more revenue. Miner is running for re-election Nov. 5 against the Green Party's Kevin Bott and Conservative Party candidate Ian Hunter. DiNapoli has endorsed her. Contact Michelle Breidenbach at (315) 470-3186, mbreidenbach@syracuse.comor follow on Twitter @mbreidenbach. 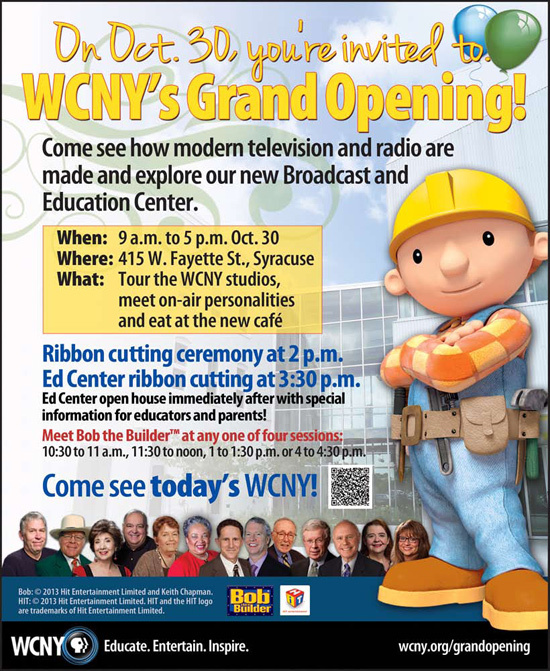 You're invited to WCNY's Grand Opening! Prevailing government policies and practices render many charitable nonprofits less efficient and effective, according to findings presented in a new report by the National Council of Nonprofits. Investing for Impact: Indirect Costs are Essential for Success details how a combination of inconsistent terminology by governments, arbitrary application of those terms, and unrealistic expectations impair the ability of nonprofits to deliver services that governments at all levels contract with them to provide and weakens the viability of the entire sector to provide services to the public on behalf of governments. Among other findings, the report challenges outdated thinking and demonstrates that actual indirect costs range from 20 percent to 40 percent at charitable nonprofits. Investing for Impact offers practical solutions that governments at all levels can adopt to strengthen the government-nonprofit contracting relationship while ensuring higher-performing partners and cost savings for taxpayers. Charitable nonprofits are invited to help ongoing contracting reform efforts by sharing your experiences and problems with contracting with local and state governments. For more on the report and on the Council of Nonprofits’ government-nonprofit contracting reform initiative, go towww.govtcontracting.org. When the federal government shut down on October 1 due to the failure of politicians to reach agreement on a bill to fund federal programs, many people presumed that the government would be closed for only a few days and the impact would be relatively light. However, the widening chasm between the political parties suggests that the shutdown could continue for weeks, perhaps even spilling over to and beyond the October 17 date when the federal government will hit the statutory debt limit. Every day of shutdown increases the tally of adverse effects for nonprofits and the people they serve. Many federally funded, community-based programs that provide food for infants, children, veterans, and seniors, such as Meals on Wheels and WIC (Women, Infant, and Children Supplemental Nutrition), report having only enough resources to continue operating for a few more days. At least 23 Head Start programs in 11 states have already run out of money, leaving children without access to vital educational programs and their parents scrambling for options. People who could be applying for Social Security, Medicare, Medicaid, veterans' benefits, or other essential programs -- all of which have been idled during the shutdown -- turn to charities for help. Members of the VISTA national service program continue to accrue their stipends during the shutdown, but they won’t be paid until government operations resume, according to the Corporation for National and Community Service; yet, VISTA participants reportedly are prohibited from taking second jobs to earn other income while they wait to be paid. Government shutdowns – just like arbitrary sequestration cuts – may stop funding, but they do not stop human needs. Indeed, they actually increase needs. When people are in need, they turn to charitable nonprofits for help – yet nonprofits have been stretched beyond capacity the last several years since the Great Recession due to higher demands for help and reduced revenues. Maryland Nonprofits’ blog offers information about how the shutdown could affect nonprofits and some of the major safety net programs on which their clients rely. The blog also includes a link to a survey that nonprofits can use to share how the shutdown is affecting their organization and the communities they serve. The North Carolina Center for Nonprofits is providing to its members guidance released by the N.C. Office of State Budget and Management on how the shutdown could affect nonprofits with state contracts and grants. Similarly, the Connecticut Association of Nonprofits is circulated information on the shutdown from one of their U.S. Representatives and the Connecticut Office of Policy and Management. Several other State Associations are also collecting stories and feedback from nonprofits in their states about the impact of the shutdown, including the Foraker Group in Alaska, Nonprofit Association of Oregon, and Utah Nonprofits Association. The Minnesota Budget Project (of Minnesota Council of Nonprofits) is sharing the impact of the government shutdown on Facebook and Twitter. Tax reform discussions for the 2014 legislative sessions are already underway across the country. Last week New York Governor Cuomo announced the creation of a new tax reform committee tasked with reducing sales taxes for individuals and businesses. The new tax committee must submit its report to the Governor by December 6, 2013. The Nebraska Legislature’s Tax Modernization Committee kicked off a series of tax reform hearings in September that seek to gather input from the public on tax reform topics. The Committee has until December 15 to submit its recommendations to the Legislature. The Nonprofit Association of the Midlands is working to engage local nonprofits in the state tax reform dialogue to ensure the organizations have a seat at the table on tax changes that could negatively affect their work in communities. Vermont policymakers during their 2014 session are also expected to discuss a tax reform proposal that would cap all itemized deductions, including the charitable giving incentive, at 2.5 times the standard deduction. Common Good Vermont and several other nonprofits in the state have alreadyvoiced concerns about the proposed change. Property Tax Exemptions: The New Jersey Supreme Court ended a decade-long battle over property taxes, ruling that nonprofit organizations that provide housing and other services to mentally ill and disabled persons do not owe property taxes on their residential facilities. The Court’s unanimous decision stressed the importance of protecting nonprofits’ tax-exempt status because it decreases the demands on government. The case represents a crucial precedent in New Jersey, where the state and local governments have tried on several other occasions in recent years to levy taxes, fees, or PILOTs on charitable nonprofits. Property Tax Exemptions: The Ohio Tax Commissionruled that a hospital must be reimbursed for more than $1 million in property taxes assessed by a local school district. The nonprofit hospital had been paying property taxes for five years despite having applied for tax-exempt status in 2008. The Commission ruled that the hospital is classified as a nonprofit organization and, therefore, should have been exempt from property taxes during this period. Illinois taxpayers, individuals receiving vital services, and nonprofit service providers are the beneficiaries of ongoing contracting reform efforts. Key areas of progress include creation of an electronic document repository, reduction of nonprofit monitoring from annual reviews to once every three-to-five years, and adoption of a common contract agreement template that five separate state agencies can use, according to a report to the Illinois General Assembly from the Management Improvement Initiative Committee (MIIC). The Centralized Repository Vault (CRV) is generating savings by allowing nonprofits to electronically upload standard documents like an organization’s articles of incorporation and IRS Form 990 only once, when previously they were required to submit as hard copies to each state agency multiple times – thus saving taxpayers the costs of storage and retrieval. The MIIC is also working on a process for accepting deemed status of service providers to reduce regulatory burdens on nonprofits and a new standardized billing system and reporting format. MIIC was created in 2011 by the General Assembly to improve government-nonprofit contracting practices and procedures across Illinois’ five human services agencies. Nonprofits nationwide are actively engaging with policymakers in efforts to prevent a second round of sequestration cuts from taking effect in January of 2014. The Maine Association of Nonprofits is hosting a discussion with Senator Angus King to end sequestration and demonstrate how the arbitrary and across-the-board cuts are limiting the ability of nonprofits to serve their communities. Similarly, the National Head Start Association held a rally on October 2nd at the US Capitol to demonstrate the adverse effects of current and future sequester cuts. Those cuts have already forced Head Start programs nationally to drop 57,000 children from their early education programs in addition to firing teachers, cutting schedules and reducing transportation for low-income families. The advocacy efforts of nonprofits like these are essential for ensuring that policymakers and the public see the true cost of these arbitrary cuts and recognize the impact they have on charitable nonprofits and the communities they serve. Readers can share stories about how sequestration has affected their communities and read others, from every state, atwww.GiveVoice.org. The Best Times to Post on Social Media: Introducing the Burrito Principal (Beth’s Blog)It’s a question that is often asked, "when is the best time to post on social media?" While the same solution won’t work for everyone, Beth Kanter provides a simple, but often overlooked, insight: post when your fans have downtime online. Whether they’re just clocking in for the morning, grabbing a bite at lunch, or checking in after a long day, contemplating your audience’s social media viewing habits can increase your chances of getting important messages heard. Don’t Fall Into This Trap That Could Destroy Your Blog (ProBlogger)Comparing yourself to other nonprofit blogs, websites, and social media pages can be a great way to get ideas and get started, but it’s important to go your own way. Imitation may be the highest form of flattery, but as this blog post points out, it’s easy to get wrapped up in how your blog performs against your one-time online communications idols. 13 Ethical Ways to Increase Your Site’s Search Traffic (Mashable)When you’re first starting out with a website, it can be all too tempting to use trickery to boost your search engine ranking. The fact is that providing great content (the kind people want to find when they search) is the key to getting your rank up and keeping it there. These lessons from the for-profit sector are good things to keep in mind for any nonprofit website goals. Three Tips for Managing Your Interns & Skilled Volunteers (Idealware)Interns and volunteers can save you an incredible amount of money, help to make your organization run smoother, and become valued members of your team. That is, of course, provided they are well managed, and welcomed to an environment that nurtures good work. This guest blog post, written by an intern at VolunteerMatch, will give you some ideas as to how you can get the best performance out of your part time staff. One Page Scrolling Web Sites: A Great New Way to Tell a Story (The Chronicle of Philanthropy)When dealing with large campaigns, it is important to tell a compelling story, and translate it clearly and concisely. While you wouldn’t want to use it on every page of your site, or in every campaign, a single vertical page full of engaging multimedia can be a great way to walk your reader from the beginning to the end of your story. New Study Shows Millennials Want To Make A Global Difference (Frogloop)Looking to connect with a younger, global audience? The good news is that they want to help; you just have to know how to reach them. This study, performed by Telefonica and The Financial Times, looked at the optimism of young people around the world, and their adoption of technology, to give you insight into how you can make the connection. Nonprofit Storytelling for Crowdfunding & Online Fundraising (CauseVox)In storytelling, it’s not always what your organization does that tugs at your donor’s heartstrings, but the people you help, and the difference it makes. This blog post gives examples of how you can break away from the “laundry list of programs your nonprofit provides” and make a unique, impactful statement in your fundraising appeals. Tracking Volunteer Time to Boost Your Bottom Line: A Complete Accounting Guide (blue avocado)Your volunteers work hard, are they receiving due credit? Tracking your volunteers’ time can give you a unique perspective on the amount of work your organization is doing, and the return on investment your donors enjoy. This guide will give you everything you need to get started, including a sample tracking form. Idealware’s Nonprofit Social Media Decision Guide: Three Perspectives (TechSoup)You like us! You really like us! This blog post, written by our friends at TechSoup, shows how jam packed our Nonprofit Social Media Decision Guide really is, as three writers offer three unique takeaways from the report. Using SROI to Show Your Nonprofit’s Impact (About.com Nonprofit Charitable Orgs)We all know about ROI, or return on investment, but what about SROI: social return on investment? You can determine the impact of your nonprofit by looking at what would happen if your nonprofit never existed, thereby determining your value to your community, and comparing it with the cost to run your programs and how many people you are helping. This unique approach to outcomes measurement isn’t for everyone, but the right organizations can make compelling arguments for their value to donors and foundations. My appreciation for what leadership is – and isn’t – has been sharpened lately listening to stories about first jobs. One young adult close to my family shared his experiences working for a leader who sounds like the antithesis of a "servant-leader." Hearing that young person's misgivings motivated me to search for resources about good governance and inspiring leaders, both of which are abundant in the charitable nonprofit community. Hence the theme of this issue of Nonprofit Knowledge Matters. Whatever your leadership lens, we hope these articles will offer ideas for discussions with your nonprofit peers about the leadership role charitable nonprofits play in communities, and the characteristics you aspire to demonstrate in your own leadership journey. We expect so much of leaders. And leaders expect so much of themselves. But one person, or even a small leadership team, may have a blind spot. We’ve all read about the “wisdom of crowds” and the challenges of overworked, overstressed leaders making decisions. What if your nonprofit used a governance and decision-making process that made the organization smarter than any one leader/small leadership team? Read more in our guest post by Sheella Mierson. Nonprofit leaders take their role seriously. That’s why convenings hosted by state associations of nonprofits often include conversations about effective leadership. Paul Schmitz, keynote speaker at the recent Nonprofit Leadership Summit hosted by theNew Hampshire Center for Nonprofits, and author of Everyone Leads, has questioned the premise that leadership is only for a few. Another leader and convener of nonprofits in New England, Common Good Vermont (a Nonprofit Ally member of the National Council of Nonprofits), has taken up the mantle of leadership in a big way. Common Good Vermont aspires to weave leadership and citizenship into the fabric of the Green Mountain state so that leadership is not just something that others do, but something thateveryone does. Find out more aboutCommon Good Vermont's initiative in an article by Council of Nonprofits intern Molly Tilghman. A new report from Grantmakers for Effective Organizations (GEO) highlights how funders can support nonprofits engaged in collaborations.Working Better Together: Building Nonprofit Collaborative Capacity lays out insights on the core capacities nonprofits need to effectively collaborate — including strong leadership and an open mindset, the ability to share power and responsibility, adaptability and flexibility, and strong connectivity and relationship building — and how grantmakers can play a vital role in building these capacities. As described in the report, key roles grantmakers can play include: helping nonprofits make connections with collaborative partners, offering core support (i.e., unrestricted) long-term funding, and providing other resources, such as technology, that may be needed to support and enable collaborative work. Kudos to the many leaders in the nonprofit community who havesigned the pledge to educate donors and grantmakers about the fact that programs run by nonprofits require general operating funds to turn on the lights, process payroll, purchase liability insurance, and pay for a myriad of other “indirect costs.” Charitable nonprofits are also taking a leadership role in spreading the word thatgovernment contracts and grants should reimburse nonprofits for the indirect costs that they incur. If your nonprofit provides services on behalf of governments, we think you will be interested in a new report from the National Council of Nonprofits, Investing for Impact: Indirect Costs Are Essential for Success. Even if your nonprofit doesn't have any government contracts or grants, you will still find Investing for Impact useful because it shares substantial research for board members and funders about the need to invest in core infrastructure to have a stronger nonprofit. The new report offers nonprofits ideas for how to explain to their government partners and private philanthropy that payment of indirect costs is vital to the effectiveness of the services provided, and for the sustainability of the nonprofit. The report includes practical solutions that governments at all levels can adopt to strengthen the government-nonprofit contracting relationship, ensure higher-performing nonprofit partners (and cost savings for taxpayers). BUT -- it’s up to charitable nonprofits to lead the way with the key messages in the report when negotiating with governments. Lead on! Looking for leadership experience? Learn about serving on a nonprofit’s board!